Pogo Drive combines full feature 3.5-inch TFT colour touch-screen satellite navigation with the highly acclaimed Origin360 speed camera and accident blackspot database, in a stylish compact 'plug and play' design. The Pogo Drive provides detailed street-level mapping of the UK and Western Europe and features full postcode search and auto re-calculation of route. The Pogo Drive also features a dedicated speed camera only mode, and includes 6-months free subscription to the Origin360 database. Pogo Drive has been discontinued. Accessories are still available for your Pogo Drive click here. Pogo Drive represents a new breed of GPS-powered driver information systems, combining advanced touch-screen street-level navigation with the award-winning Origin360 speed camera and accident blackspot alerts. The Pogo Drive features a high quality 3.5-inch TFT colour touch-screen, dual range speakers for clear high quality audio route navigation announcements with pop-up speed camera warnings. 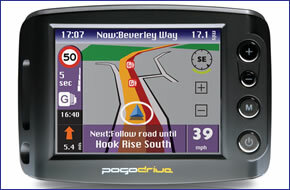 The Pogo Drive is preloaded with detailed street-level mapping of the UK and Western Europe with full postcode search. A choice of 2D or 3D map views and turn-by-turn voice guidance are also provided with the Pogo Drive. With Pogo Drive, navigation is only half of the story. The highly acclaimed Origin360 speed camera and accident blackspot location system is on-board to ensure that you reach your destination safely. Pogo Drive will warn you of the presence of ALL fixed location speed cameras, accident blackspots and school zones, providing both voice and on-screen alerts. As you approach a fixed speed camera, Pogo Drive will provide a countdown, starting at a specified distance/time before the hazard, and a spoken reminder of the prevailing speed limit. The Pogo Drive also includes individually adjustable alert volumes. Pogo Drive will warn of ALL fixed cameras, including Gatso speed cameras, Truvelo speed cameras, Watchman speed cameras, Speed curb speed cameras, SPECS average speed cameras, DS2 Speedmaster and accident blackspots. The Pogo Drive provides a directional feature that gives alerts of speed cameras only if the warning is applicable to your direction of travel and a patented 'Limitator' feature that warns only when travelling over the prevailing speed limit. Pogo Drive also provides drivers with warnings along stretches of road which are known accident blackspots and provides warnings at appropriate times during weekdays to Schools and gives warnings about Congestion Charging cameras. The Pogo Drive also features day and night operation modes, points-of-interest including hotels, petrol stations etc and includes internal rechargeable battery for cordless operation in car/out of car. The Pogo Drives' route optimisation preferences include quickest/shortest/fast car/slow car/pedestrian, etc. ‣Free speed camera subscription for six months, then £50 per year. Pogo Drive is ready to use - straight from the box. Simply plug the power lead into your cigarette lighter socket and use the suction cup mount to secure the Pogo Drive to the windscreen. The plug-and-go ability makes it easy to move the Pogo Drive from vehicle to vehicle. At the heart of Pogo Drive is a comprehensive database of all the motorways and classified roads in Great Britain, including information about one-way systems, intersections, junctions, and roundabouts. Major roads in Europe are also covered by Pogo Drive. Pogo Drive also includes a complete postcode database to allow you to specify a location anywhere in the UK with pinpoit accuracy. Pogo Drive ultilises the Origin360 award-winning database of speed camera and accident blackspot locations to provide the most accurate and up-to-date information available. Data downloads are carried out via the internet using the download software supplied. Pogo Drive comes with a free six month subscription, thereafter an annual fee of £50.00 applies. In order to update the Pogo Drive safety camera database you will require a PC running Windows 98, 2000, ME, XP or Vista system software and Internet access. Want to add accessories to your Pogo Drive? We sell a vast selection of genuine Pogo parts and accessories.